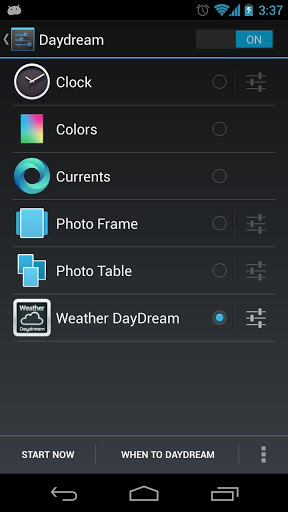 Weather DayDream Screensaver (Android) ~ Android Forever! 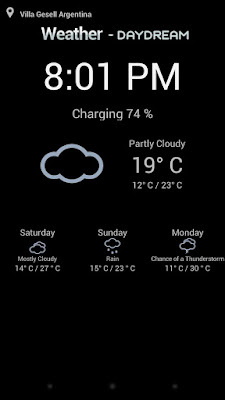 Developer Quote: "This is a DayDream (Screen Saver) widget which shows the hour, current weather, charging level and extended forecast." 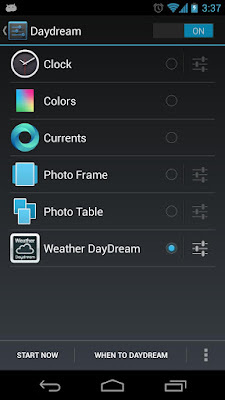 If you're a Jellybean user (Android 4.2+), you surely use the DayDream screensaver feature. Surely. If not, you're missing out. Trust me, the DayDream feature is very cool. It enables your device to show a screensaver when the screen goes to sleep instead of blackness. I use mine when my phone's being charged. There are many apps work with the DayDream feature, but finding one that has the weather is a problem. That;s where Weather DayDream comes in. It's the only one available right now that I can find, but that doesn't mean it isn't awesome. Check it out, it's only $2.99 at the time of this writing.